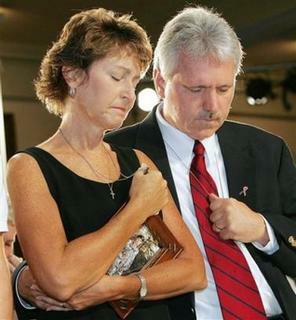 Pro-military families hold a prayer vigil in Atlanta tonight. Georgia mourned its fallen troops and paid homage to those still serving Thursday during a prayer service and moment of silence. Flags atop public buildings flew at half staff, and a Capitol service was webcast so members of the Georgia National Guard’s 48th Brigade in Iraq could watch. Gov. Sonny Perdue announced plans for the memorial two weeks ago when the 48th Brigade suffered 11 casualties in 11 days. Four more members have died since then. A vehicle accident killed another brigade member in June. The service drew hundreds of servicemen and women to the Capitol, along with veterans long retired from active duty. “I’m here to support the troops, some of whom could be my grandkids. I think it’s an appropriate thing to do, to show support,” said Tom Salter, 63, who was a bomb disposal officer in Vietnam. 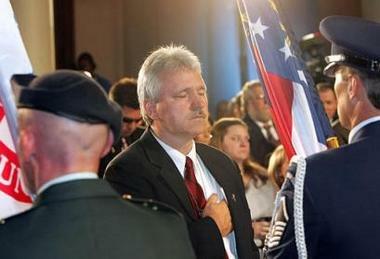 With his son in Iraq, Robert Stokely had planned to attend the Capitol service. On Thursday, however, 23-year-old Sgt. Michael Stokely was among those being mourned. While liberals continue assault on the military today. What is this Kansas liberal-democrat doing in Atlanta protesting? 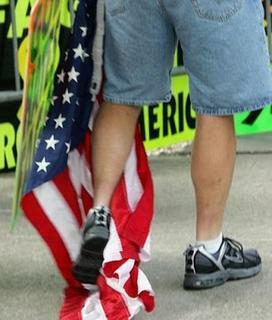 And, why is this Christian man protesting a prayer service?